The 10 Best First Date Locations in West Virginia! Location, location, location. One of the most important aspects of a first date! For a good first impression, you’ll want to choose a nice, comfortable, open space for your first date. Whether it be a beautiful state park, a cozy café, or a concert venue, there’s something for everyone. Here are the 10 best first date locations in West Virginia. The backdrop for romance in this beautiful part of the Mountain State is Summersville Lake, a 2,700-acre man-made reservoir and the biggest lake in the state. Situated on the Gauley River, there is a recreational side to the lake that’s worth exploring, especially when getting to know someone. Depending on the time of year you visit, you could dip your toes in the cool water one of the beaches near Battle Run campground. Or for the more adventurous couple, you might stop at one of the scenic overlooks to admire the beauty, then follow that up with a picnic at the dam. Whatever you choose, it’s a great place to spend time together enjoying the natural beauty of the area. Audra State Park, located in Buckhannon, West Virginia, has beauty and history and is a great place to discover with someone special. The remains of an old grist mill are still visible along the Middle Fork River, and you’ll have a great time exploring the beach, taking time to enjoy the rock formations along the water and maybe take a swim. Alum Cave is a great place to check out, too, and if you have a kayak, there’s a place to put in for a great ride down the river. There are several spots at Seneca Rocks in Elkins, West Virginia, that are worth seeing. Park of the Monongahela National Forest, Seneca Rocks is one of the most well-known and frequently photographed parts of the state, and of special interest to rock climbers. The 3.4-mile trail here offers the opportunity to leisurely walk through the beautiful wooded area, and leashed dogs are welcome. If you make it to the top, you’ll be treated to a special panoramic view below you. What better way to get to know someone than to spend the day on the water? With choices to go whitewater rafting, canoeing, kayaking, swimming, or boating, you’ll have no end to the fun along the New River or the 7,000 acres of recreational land that’s part of this wonderful area located in Fayetteville, West Virginia. The wild flowers are gorgeous any time of year, but the colors in the fall are especially breathtaking from the overlooks at Grandview as the whole countryside comes alive with red, gold, and orange. For more than 30 years, visitors to Mountain Stage in Charleston, West Virginia, have been treated to some of the best live music in the state, maybe even in the country. More than 150 stations across America carry the music brought forth at this unique venue, and music from every genre has been played here from folk to blues, country to rock, international to alternative. Since music is the language of the heart, this is a great place to take a date and see what music you have in common. 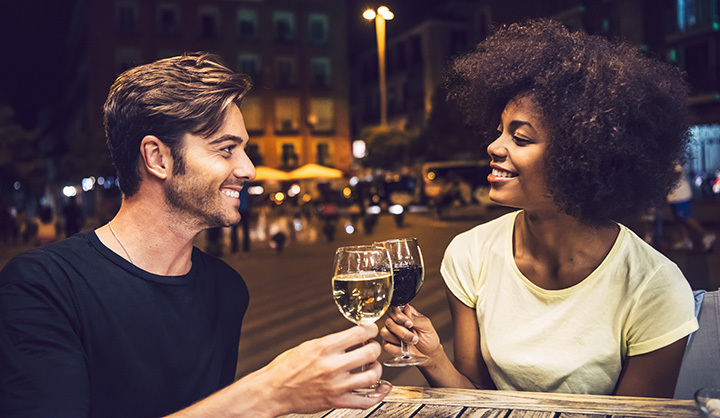 It may seem like a strange idea to bring a first date to a market, but there is so much to do and see here, you’ll have no trouble finding things to do. As you wander through the market located in downtown Charleston, you can stop to get your morning coffee together at the Mea Cuppa Coffeebar and spend the day, meet for lunch at one of the great eateries like Soho’s Italian Restaurant or the Sushi Garden, pick up some chocolate from Holl’s Swiss Chocolatier, and a bottle of wine at the Wine & Cheese Shop. You’ll make memories and develop a better connection with whomever you bring here. Want to impress someone with a trip back into West Virginia’s history and enjoy the day in the amazing outdoors? Go to Cass Scenic Railroad in Cass, West Virginia and take a ride on the train up the mountain for a two- or four-hour journey that you won’t forget. The interactive presentation at the foot of the mountain and the 11-mile train ride in a unique and authentic Shay locomotive give a glimpse into what life in a rural lumber town was like. There’s always a little nip in the air as you ascend, so make sure you have a sweater or light jacket for the trip. Forget dinner and a movie for your first date. Take that special someone you’d like to get to know better to Old MacDonald’s Pumpkin Patch & Corn Maze located in Inwood, West Virginia and spend the day at the farm! Family and kid-friendly, you’ll be able to take a break for your daily routines and tour this seventh-generation farm that lies partially beside Middle Creek. The farm raises hay, corn, and pumpkins, and the five-acre corn maze takes about 20 minutes to walk. This date will bring out the kid in both of you. Located in the heart of Berkeley Springs, West Virginia, it’s only fitting that you bring matters of the heart to Tari’s for a sweet dining experience. Not far from the park and spa, which are also worth a stop, this tavern-style eatery specialized in preparing the best food using locally sourced fresh ingredients. Open seven days a week, you can enjoy the unique artwork displayed inside while you decide what to order. If you’re there for lunch, you have to try the Almost Famous Cream of Crab Soup. They have delicious salad choices like the barbecue chicken chop chop and their burgers are palate pleasing, too. If your new gf or bf is a foodie like you, you’ll definitely want to visit Dem 2 Brothers & a Grill in Charleston. Known as the “best smelling corner in Charleston,” this is where you can get your barbecue on in a big way with favorites like pork shoulders and ribs by the slab or by the pound, dine in or carry out. Sides include cole slaw, baked beans, mac and cheese, green beans, collard greens, sweet potato casserole. Yes, you might just fall in love here!